Today a different “Food for Thought” as I will refer you to a petition from Jamie Oliver where he asks for help to fight for Food Education in schools. 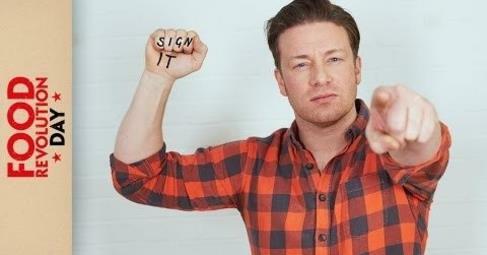 One might think on or the other way about Jamie Oliver but what I like a lot about him is his passion on food education. Obesity is something close to my heart, an area I currently educate myself in. An area in that I hope that I will be able to reach out to people who want to change to be healthier. But it is one thing to reach out to adults who often at least know that moving and healthy eating is important but who might feel helpless in taking this first step into a healthier and fitter life. But it is a totally different scenario when you want to approach children. They often are helpless, hardly aware of the difference of healthy and unhealthy food, hidden sugars, fresh fruits and vegetables, or even the difference between fast food versus fresh home cooked meals. Unfortunately obesity among children is on the rise and is it needless to say what huge negative impact that will have on their health and life when they grow up. We need to get more tools on hand to educate children all over the world about healthy food. That is why I signed Jamie Oliver’s petition for “compulsory practical food education in schools across the world” and I hope you will, too. Please have a look at his petition and sign if you feel you want to make a change is this area. Thank you!